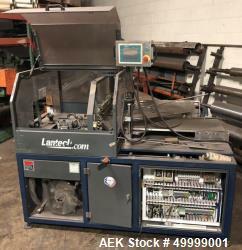 Used - Lantech S-300 Semi-Automatic Stretch Wrapper. 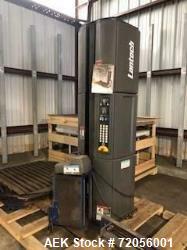 Used- Lantech S-300 Semi-Automatic Stretch Wrapper. Cut and Clamp Film capture. Rated 25 to 35 loads per hour, 30" film delivery system, maximum load diagonal 76", maximum load height 80", wrap speed 1-12 rpm. Base mounted. Serial# SM2213. 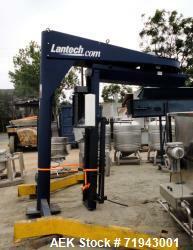 Used- Lantech Q-300 Semi-Automatic Stretch Wrapper. 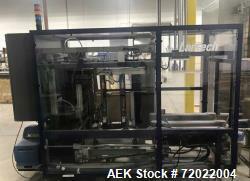 Used- Lantech Q-300 Semi-Automatic Stretch Wrapper. Capable of speeds from 25-35 loads per hour. Maximum load diagonal 72"; height 80"; weight 4000 pounds. 65" Diameter turntable driven by an approximate 3/4 hp motor. Film capacity 10" roll diameter, 20" film web width. Digital control readout. Serial # Q4150. Used- Lantech, Model S2503, Automatic Stretch Wrapper. 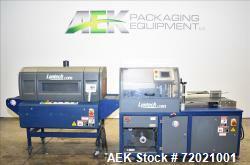 Used- Lantech Model Q300XT, Semi-Automatic Stretch Wrapper. 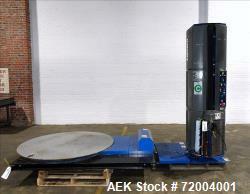 Used- Lantech Semi-Automatic Stretch Wrapper, Model Q300XT. 3025 mm long x 1702 mm wide x 2337 mm high (119" long x 67" wide x 92" high). Approximate Shipping Weight 1270 kg (2800 pounds). Mfg. 2006. 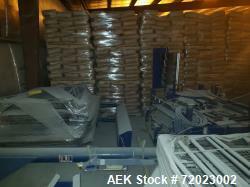 Last used to wrap pallets of animal feed.